The idea of holding on for dear life to a sense of childlike wonder and hope in a world that tries to tear you down is a pretty beautiful thing. Over The Garden Wall is a ten episode long mini-series recently released by Cartoon Network. Each episode is around ten minutes long giving the entire series an approximately movie length 100 minute or so running time. Within those constraints Over The garden Wall tells a brilliantly paced narrative that says a lot about how the current generation of parental aged artists views the world we have left for today’s children. It’s a simple premise for a story. 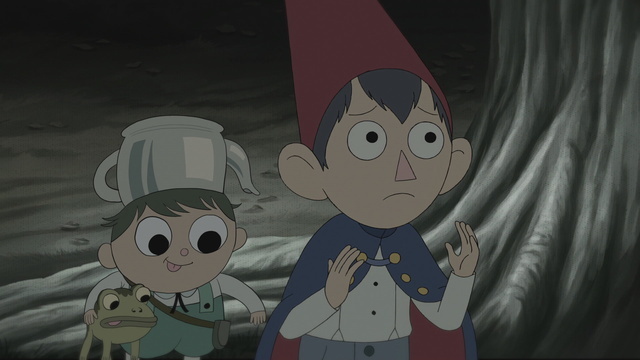 Wirt, a boy in his early to mid teens, accidentally gets lost in a strange set of woods with his younger brother Greg. Together the pair try to find a way to get home while exploring a set of small set piece stories that all start off welcoming and cheerful, but with subtleties setting the scene that something is not quite right. Things become super sinister, they find a way out of the situation and everything works out okay in the end. That said, everything is a little less okay every time. Where this story truly becomes interesting is as a character study of childhood innocence and being hopefully optimistic contrasted with early teenage cynicism and fear of the unknown. At it’s most basic level the first three quarters or so of the show are a battle of perspective between Greg’s childhood belief that everything will turn out okay if he trusts those around him and keeps on smiling versus Wirt’s teenage terror at the almost Miyuzaki-esque fantasy world the pair have found themselves in. Wirt is understandably tense and defensive, he’s responsible for the safety of his brother in a world he can see is full of countless horrors and dangers. From monstrous old women who can control actions with the mere ring of her bell to towns of skeleton men pushing the pair to dig their own graves, he sees the horror of the world he’s in and has to struggle to keep himself together in spite of that. Greg on the other hand doesn’t seem concerned by the events unfolding around him, perhaps because he’s young enough that the average day to day world still doesn’t really make sense to him. Being young enough that any kind of unknown is the same, he keeps a stiff upper lip and trusts that those around him will pull through and keep him safe in the end. Even when isolated and facing the worst possible odds, he grits his teeth and smiles, optimistic far beyond the point it seems possible to see hope. The world doesn’t make sense to him, but he knows that the people who care about him will keep him safe and as such just doesn’t worry about it. Over The Garden Wall succeeds at successfully portraying the benefits of both outlooks on life, without talking down to either. It understands that it’s cast and it’s audience have all experienced optimism optimism and cynicism either first hand or second hand in others. The viewer may be a child with a cynical teenage brother, a cynical teen with an annoyingly optimistic little sister or even an adult looking back on themselves at those ages. It never looks down on those changing perspectives, but presents them as perfectly understandable perspectives for different stages of life. In the end, I feel like this show says a lot about the people who created it. It has been born out of a generation of adults watching children pressured into growing up faster than ever before, a generation of adults mourning the increasingly rapid loss of innocence and naive trust in the world that used to define childhood in western society. Over The Garden Wall celebrates the idea of holding on for dear life to a sense of childlike wonder and hope in a world that repeatedly tries to tear you down. The way it builds to it’s equally heartwarming and heartbreaking conclusion is beautiful, and reminded me that while fear and cynicism are important tools for self preservation, I need to let a little childlike wonder out every now and then.